Discovered in 1973 and first scientifically described in 1978, the Golden Poison Frog is one of the largest of the poison dart frogs and it can grow to 5 centimetres. Its bright colour can vary, especially geographically, but is either golden-orange, golden-yellow or pale green. This frog is famous for being one of the most poisonous animals in the world and a single frog carries 1,900 micrograms of poison. The poison is so strong that it was used by Chocó Indians to poison their hunting darts, and may have once been used in warfare. The Indians would rub the tip of a dart (not an arrow) along the back of a live frog. Once dry, the poison would remain active on the dart for up to a year. The back of a single frog would provide enough poison for two or three darts; the frog was unharmed and released back into the wild. The Indians used the darts to hunt mammals and birds. 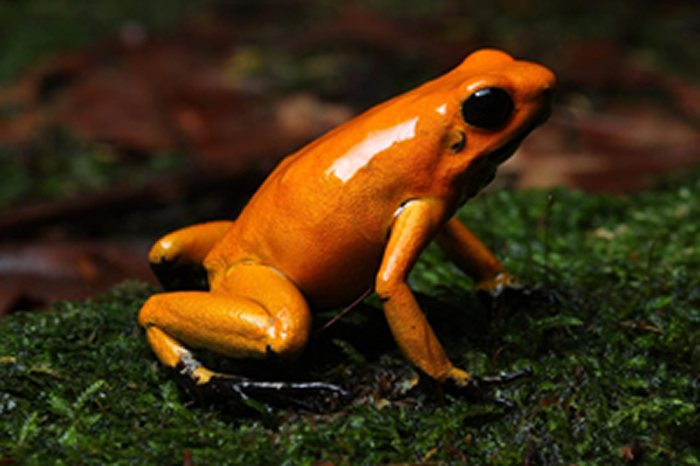 Golden Poison Frogs are territorial and live on the ground. The female lays eggs on the ground and the male transports the larvae to permanent pools. The species feeds on small invertebrates such as flies, beetles, crickets, ants and termites. Probably due to its lethal deterrent, the Golden Poison Frog appears bold when danger threatens; it does not hide, but simply hops away. The poison is the only defence the frog has against predators, it has no delivery system (such as sharp teeth or spines) and can only secrete the poison through its skin. Very small quantities of its poison can be fatal if they enter the bloodstream. A single frog may contain enough poison to kill more than 20,000 mice, or more than 10 people. Toxin equivalent to two grains of salt is enough to kill one person. The poison permanently prevents nerves from transmitting impulses, which leads to heart failure. Death occurs in less than 10 minutes and there is no cure. The Golden Poison Frog is endemic to a small area in Colombia. It lives on the forest floor in tropical rainforest, in a small and dwindling area of the Cauca Department on the Pacific Coast. The rough, hilly country where it makes its home is in westernmost Colombia. Here, World Land Trust has helped to create the Rana Terribilis Amphibian Reserve, specifically to protect this frog and its habitat, one of the wettest tropical rainforests in the world. Despite being one of the most poisonous vertebrates in the world, this deadly creature remains extremely vulnerable to loss of habitat, which can come about from logging, gold mining, deforestation for agricultural development, followed by planting of crops (illegal) and pollution from crop spraying. It lives in a very restricted area and this increases its vulnerability further. The habitat of the Golden Poison Frog was completely unprotected until 2012, when World Land Trust raised money to save its habitat with the help of corporate supporter Puro. 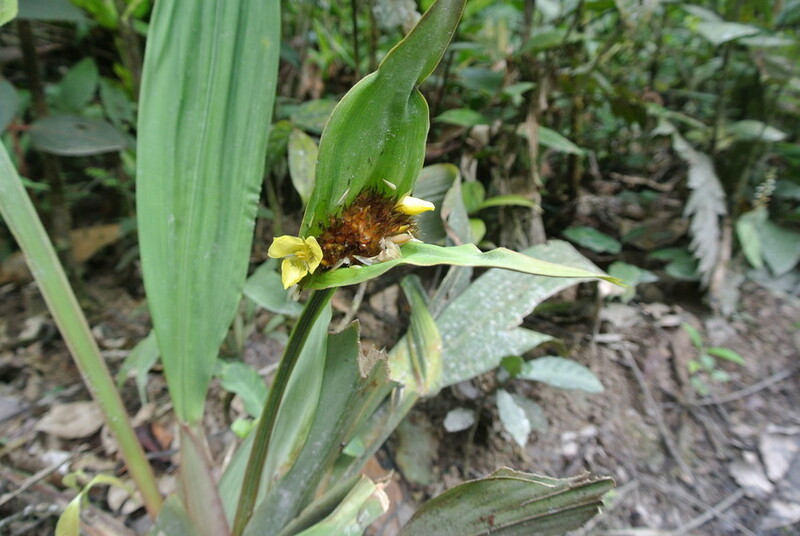 The reserve was created in partnership with Colombian NGO, Fundación ProAves. Today, World Land Trust’s support for a wildlife ranger in the reserve continues to play a vital role in ensuring the survival of this tiny-deadly amphibian. Rangers funded through the Trust’s Keepers of the Wild patrol and monitor the land, preventing illegal logging and hunting.